WHY DO WE FOCUS ON GOLDEN EAGLES? 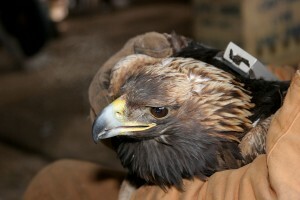 Eastern Golden Eagles are a small, isolated population, which puts them at risk. DOAS has been active in raptor research efforts since 1989 when the organization established the Franklin Mountain Hawkwatch at the DOAS Sanctuary. Franklin Mountain has since become known as the most important fall concentration point for Golden Eagles in New York. DOAS research efforts have also shown our region to be winter habitat and an important spring concentration area. WHAT HAVE WE BEEN DOING BEYOND FRANKLIN MOUNTAIN? We have conducted focused spring migration counts at locations identified by GPS telemetry. We have operated winter camera traps in our region since 2010. We are working with a number of scientists and organizations on eagle conservation, including Dr. Todd Katzner, USGS Research Wildlife Biologist and a lead researcher with the Eastern Golden Eagle Working Group, The Hawk Migration Association of North America (HMANA), and the National Audubon Society. We provide data and comments for wind projects in our region to help protect this species – which is unusually susceptible to impacts from wind turbines. We conduct public education on Golden Eagles in New York, addressing conservation concerns and threats such as wind power and lead poisoning. The Golden Eagle Tracking Project will provide accurate data regarding winter habitat and migratory routes used by this rare NYS Endangered Species. These data will be used for proper siting of wind energy infrastructure, and will raise awareness about our region’s importance as winter habitat and a migratory concentration area. Collecting GPS data every 15 minutes allows us to identify important habitats used by eastern golden eagles. The need for more and better data became apparent in the early spring of 2013 when an application to build a commercial wind project was proposed within the Cannonsville/Steam Mill Important Bird Area near Walton. The developer submitted a flawed avian impact assessment. Because we knew the area to be important during migration, DOAS took immediate action. The proposal was subsequently retracted. Additional information about this can be found on the DOAS website (search “walton wind”). Because of this incident, the board decided to initiate a trapping and tracking program in New York. (This has been done with birds that winter further south). DOAS members, supporters and the Norcross Wildlife Foundation agree to fund the purchase of 4 telemetry units. The project launched in the winter of 2014 with the successful telemetering of three out of the targeted four golden eagles. One bird stopped transmitting locations after 10 days. The unit was transmitting but apparently could not acquire 3 satellites for a GPS location. Crews of volunteers searched the last know location in Delaware County. The bird was not found. However, a short distance from the last reported location, searchers discovered multiple wild boar carcasses that had been killed with lead ammunition. It came to our attention later that a sick Bald Eagle had been found weeks earlier a mile and a quarter from the disposal site. It died shortly thereafter from extremely high levels of lead in its system. Although the evidence is circumstantial, we believe the telemetered bird fed on carcass remains at this site and became weakened and subsequently died as a result of lead poisoning. Immediate steps were taken to assure that government agencies involved in wildlife control properly dispose of carcasses to prevent scavenging species from feeding on the remains. Because of this outcome, it was determined that inclusion and promotion of the use of non-lead ammunition should be an important part of our outreach efforts. In 2016, we produced a 13 minute informational video on the dangers of lead ammunition. View the video here. 2015 efforts to trap and telemeter more eagles were delayed by manufacturing problems and extreme cold weather.